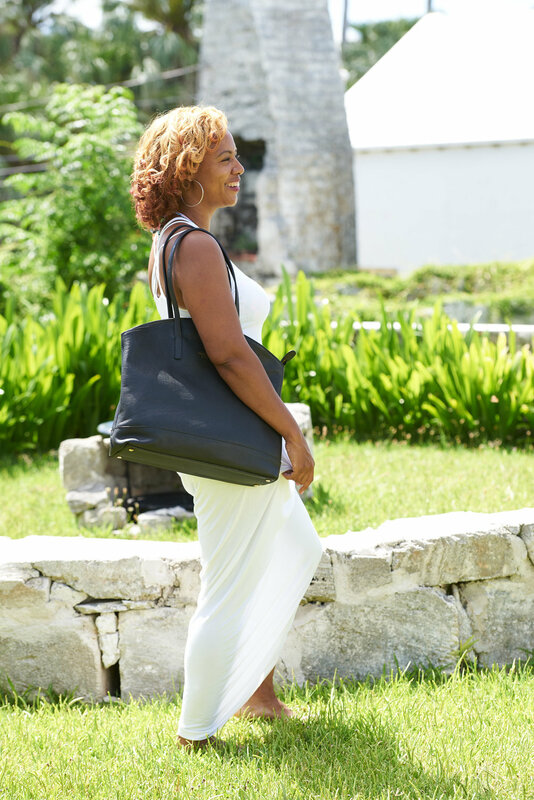 Patrice Morgan has launched her international handbag brand, Bermuda Born, with the Bermuda-inspired line including the Horseshoe Bay Cross Body Bag, Saint David’s Boat Tote Bag, Paget Purse, Long Tail Coin Purse and more. “I wanted to create versatile leather goods that appeal to a modern woman’s lifestyle, a woman who is multi-faceted, and who appreciates luxury,” Ms Morgan said. The collection consists of six contemporary styles in fuchsia, aqua, beige and black-colors synonymous with the beautiful exteriors of Bermuda’s traditional houses. Fuchsia was used to symbolize the island’s well-known pink sand beaches, and aqua was used to reflect the clear blue coastline. The brand is based in England, produced in Portugal by skilled leather craftsmen, and sold online to buyers in the UK, Europe, Canada and the USA, as well as in boutiques in Bermuda. Wonder if someone will call this xenophobic. Bermuda Born (based in England, made in Portugal!). I suppose it’s like the real Bermuda. Lovely! Where are they available in Bermuda please?? Available at FH Luxury Gifts inside of Hamilton Princess Hotel and at Exclusive Home. Congratulations Patrice. Very proud of u as a Bermudian and designer. Very well inspired colors. Congrats Patrice! I know you could do it! Lifestyles Co Ltd have the small coin purses! I am impressed by this handbags collection. I haven’t any word to appreciate this post..such you share the excellent color and types of handbags. Thanks for sharing this so interesting post! I really want to be thankful for the way you have put it here.